The following is a report of the “Meet the Alumni” program with Dr. Sandhya Prabhakaran (CEC 2001), as compiled by Allen George (CEC 2015), Secretary and Documentation Team Head of Robotics Society. 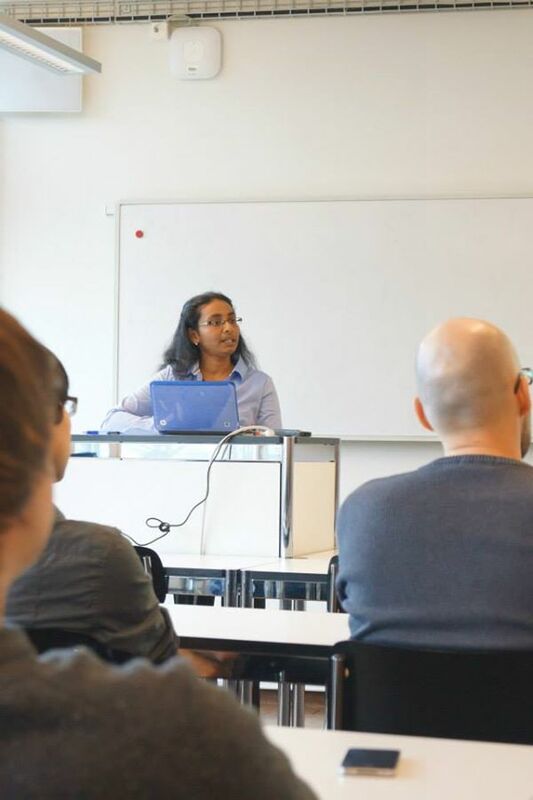 Around the onset of June 2014, we came to know about a certain alumnus of CEC – Dr Sandhya Prabhakaran. Dr Prabhakaran was a 2001 graduate of CEC. After graduation, she worked at UST and IBM for around 4 years, after which she pursued a Master’s course in Artificial Intelligence from the University Of Edinburgh, Scotland. After her MSc, she completed a PhD from the University Of Basel, Switzerland. On seeing her impressive academic profile, we decided to contact her and requested a session with her, to help clear our doubts on higher studies abroad. She gladly agreed to help, and one month later, she was in the seminar hall of CEC, chatting with us and clearing our doubts. The session was primarily focused on queries related to higher studies outside India, especially in the research & development field. There were also questions about her field of study – Artificial Intelligence & Machine Learning. Dr Prabhakaran gave valuable advice on these points, and agreed to mentor students interested in higher studies in the field. She also advised the RAS chapter on possible areas of expansion. After these queries were addressed, the fruitful session was brought to an end after Dr Sandhya Prabhakaran was awarded a memento as a token of our gratitude, by Dr Deepa J, Professor of Electronics at College of Engineering, Chengannur. Ajith Sen sir is now Dr. Ajith Sen! This entry was posted in Achievements of CECians/CEC, Alumni or ARC (Alumni Relations Cell), College of Engineering Chengannur, Higher Studies, Uncategorized and tagged Allen, Allen G J, CEC, CEC Blog, Irene Abraham, Meet the Alumni, Prabhakaran, Sandhya, Sandhya Prabhakaran. Bookmark the permalink.